First of all, sorry about the delays, but after a brief stay back in the US, work had me traveling off to Germany, where for most of the trip I was without my laptop. So I’m still playing the catch-up game. 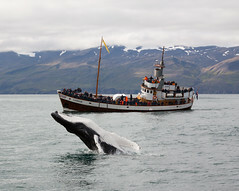 But the next stop on our trip through Iceland was a morning of whale watching up in Husavik, a small fishing town in Northern Iceland that since the 1990s has had a pretty significant whale-watching. Sure, I thought I’d been on some good whale watches before (in Southern California, and in New England), but Husavik blew both of them out of the water, since it’s one of the best places in the Atlantic to go whale watching (the bay outside Húsavík is a major feeding area in the northern Gulf Stream). The result was three hours of fairly active whale watching, with humpbacks coming right up to the boat, some white-nosed dolphins, and even a few bottled-nosed whales. See my picture here, it was even cooler than their tourism brochures. But after all that whale watching (which include some cinnamon buns and hot cocoa as snacks), we were rather hungry. Luckily, Gamli Baukur is right on the dock. 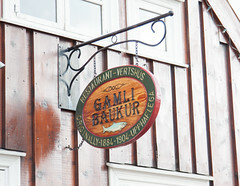 Named after an old restaurant of the same name just down the doc that used to be a famous watering hole for Husavik Decorated in a nautical theme, the original Gamli Baukur burnt down in the 1960s. The current Gamli Baukur was built in the 1990s using driftwood, and as a result has a very interesting nautical-themed interior. 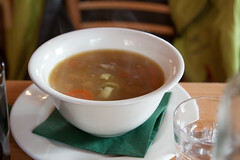 Foodwise, they are basically a pub, and have the standard menu of soups and sandwiches. Like several other places we went, Carol opted for the Kjötsúpa (“Meat Soup”) which like most places we tried in in Iceland, it was excellent. A nice rich lamb broth, with a rather hearty assortment of root vegetables and big meaty chunks of Icelandic lamb, this was both pleasant nourishment and a nice way to warm up (being basically out in the Arctic Ocean, the whale watch was occasionally quite cold). In fact, I’d say it was one of the better renditions of it we experienced on the trip. 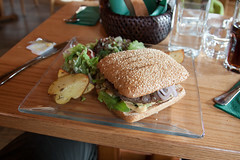 Myself, I opted for the burger, getting myself another entry in my “burgers across the world” collection. Like a lot of foreign burgers, it’s always interesting to see the local take on it. They’ve got two of what I consider hamburger basics down pat in Iceland: they’ve got some very excellent beef (since as far as I can tell, none of it is grain-fed) with some good flavor, and they don’t overcook it. The result was a nice burger patty, served up with your basic lettuce, onion, tomatoes, and a sweet mustard sauce that gave it almost the famous “special sauce” taste. The bun was the biggest difference from my normal hamburger expectations: the bun was a large, rectangular fairly dense sesame seed bun… but it worked reasonably well for this patty and toppings. I was happy with the results. Overall, we enjoyed Gamli Baukur as a nice refreshing followup to a phenomenal whale-watching trip. I’d certainly love to come back to Husavik for some more whale watching, and maybe to try out some of Gamli Baukur’s dinner menu.